Interstellar follow-up: Movie science mistake was mine. Every now and again, I screw up. Sometimes it’s small, sometimes it’s big, and I try to admit it when I do. It helps you, the reader, understand things better when I ’fess up, and it keeps me honest. Also, after all, science is all about admitting mistakes and learning from them! Well, I made a mistake in my review of the movie Interstellar. It’s actually a big but subtle one, and I’m kicking myself for not thinking of it. And it brings up another issue, a point I made in my review that quite a few folks missed, so it’s worth discussing again. 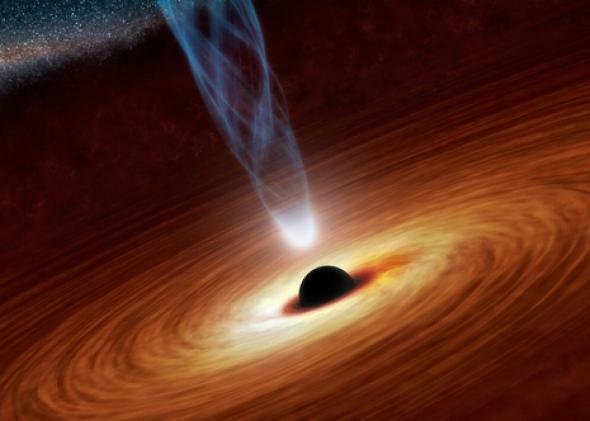 What lies beyond the spinning black hole? Spoilers. Spoilers ahoy! I have to reveal critical plot points about the movie, so if you haven’t seen it and wish your viewing experience to remain pristine, then you should stop here. Maybe you can go watch a video of Hank Green and me talking about stellar distances instead. OK, first, my mistake. In my review, I talked about Miller’s planet, which orbited so close to the black hole (nicknamed Gargantua) that time dilation effects were huge. An hour spent on the planet meant that seven years elapsed back on Earth. My claim was that a time dilation that large would mean the planet was too close to Gargantua and couldn’t maintain a stable orbit. That’s true … for a nonrotating black hole. My error was not using the right equations for a black hole that’s rapidly spinning! This changes the physics quite a bit; the effects on spacetime around the hole are large. From what I can find, there is a stable orbit around a rotating black hole that can produce that kind of time dilation, so I was wrong there. 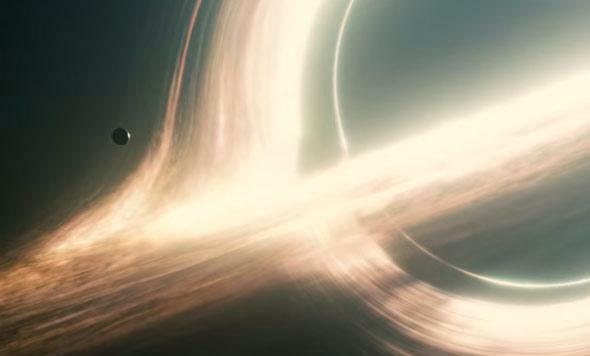 Also, I had assumed (given the way it was depicted in the movie) that Gargantua was a stellar-mass black hole, one with perhaps 10 times the mass of the Sun. However, its mass has been revealed to be much larger, 100 million times the Sun’s mass! That makes it a supermassive black hole, the kind found in the centers of galaxies (like our Milky Way, though ours is about 4.3 million solar masses). Now I have to be careful in this next part because I don’t think the jury is in quite yet. But I claimed in my review that tides from the black hole would rip the planet apart. Tides are a differential force; a planet orbiting a black hole will feel a stronger force on the side toward the black hole than the other side. For a black hole, this change in force can be enough to tear a planet to vapor! Tides depend on the mass (and spin) of the black hole, the distance from it, and the size of the planet. I’ve been in contact with a couple of astrophysicists who say tides from Gargantua should destroy the planet, but the math isn’t clear. They’re still working it out, so if and when I hear from them I’ll update this. Until then, I can’t say whether I was correct about tides in my review or not—though even if my conclusion was right, it was still based on a nonrotating black hole, so in that sense I was still wrong. I’ll note this paper has a lot of the needed math in it, but I’m not sure exactly how far Miller’s planet was from Gargantua, so it’s hard to say if tides would disrupt it or not; Interstellar’s executive producer and physicist Kip Thorne has a book called The Science of Interstellar, which I have not yet read (a copy is on its way to me, courtesy of Dr. Thorne, in fact), but it may help resolve this. Still, tides notwithstanding, what I said about the orbit stability was wrong, so I hereby rescind my claim about that part of the science of the movie. Having said that, there were still lots of other, smaller problems with the science in the movie (like, the accretion disk not being bright enough to light and heat those planets, the planets not being whacked by stuff falling into Gargantua at nearly lightspeed, tidal waves on a planet where the tides are small and seas shallow, and so on). Some were relevant to the plot and some weren’t, but they’re not really relevant here and I won’t go into details. I’ll note that in my review I wondered what influence Thorne had on the movie, and now I know. He had to figure out these far more complicated rotating black hole equations to get the math and science right. This brings up the second point: A lot of people have accused me of disliking the movie because I thought the science was bad. That’s simply incorrect. I disliked the movie because I thought the story wasn’t told well. As I noted in my review, it was heavy-handed, overwrought, and had some highly questionable dialogue. Let me be clear: I can (almost always) completely ignore bad science if the story is well told. I watch and love Doctor Who, Star Trek, Stargate, and more, and they all have pretty questionable science. I liked the movie Gravity, even though it had plot-critical bad science (or, more accurately, orbital mechanics) in it. Science without a good story is an encyclopedia entry. A good story with bad science is … a good story. Knowing some scientists who are science advisers for scripts (and having done it myself), I know that many times movies and TV show scripts are plotted out long before a scientist comes in to look at them. Sometimes it’s too late to fix something that might be wrong because it’s too essential to the plot—and most of the science advisers I know would be OK with that, because story comes first. You do what you can with what you have. This is so common I assumed that’s what happened with Interstellar, too. After all, Thorne knows more about black holes before breakfast than I do in my entire lifetime, obviously. As it turns out, my operating assumption wasn’t accurate, and that colored my thinking as well. I’ll note that in my review I wanted to write about some of the good stuff in the movie—the near-future Earth felt gritty and real to me, and the depiction of the tesseract was extremely clever and well-done—but when the review hit 2,000 words some stuff had to go! That may have helped make me look more the curmudgeon than I am. So, to sum up: The science in the movie of time dilation near the black hole was in fact accurate, I made a mistake, and for that I apologize. But for me, the movie as a story still missed the mark. Good science does not necessarily make a movie good.